ASA Sisters! The UMMZAKIYYAH - 'My Writing Journey' is webinar is today at 1 PM EST! Register at the link below and use the sign in link sent in your confirmation email to join the webinar. from 1 to 3 PM EST. ​4 -7-17 - MWWWI will launch its 2017 ANNUAL Folio on Friday April 7! September 24, 2016 - MWWWI had a wonderful time at the LOC Book Fair. We saw Stephen King, Holly Robinson Peete and Kareem Abdul Jabbar to name a few! August 30, 2014 - MWWWI members loved the 14th annual Library of Congress (LOC) National Book Festival, especially this year since it was held at the Washington Convention Center. The move indoors from its traditional spot on the National Mall enabled the LOC to extend hours and add new programming. Pictures with identifying tags of LOC Book Festival are under Events -Photos. 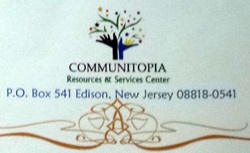 MWWWI attends Communitopia's 1st Annual Women of Honor Banquet and Auction! June 2, 2014, Zakia Iman Shahbaz of MWWWI, was invited along with other members of SHE (Sisters Halal Entertainment) to perform at Communitopia's 1st Annual Women of Honor Banquet and Auction, at Pines Manor , Edison NJ. Highlights of the program were as follows: Nabila Abdul Malik recited a poem as Nadirah Rasheed repeated it in sign language. It was an inspiring performance. Aaliyah Alim did a self-choreographed dance to a Michael Jackson tune. It was a subtle and captivating performance. Zakia did a tribute to Maya Angelou, discussing her poetry from an Islamic perspective. Poet and educator Najlah Muhammad recited one of her exciting poems and motivational speaker and author, Bayinnah AKA Ruby Moore gave a Women of Honor presentation. Later she gave a book signing of her latest book, Muslim Girl. All this was done before a very appreciative sisters' only audience. Insh'Allah, soon many more sisters will be able to welcome and enjoy the halal entertainment provided by SHE. There were no pictures allowed to be taken inside the banquet room to allow for the sisters' privacy and modesty. However, a few pictures were taken of the outside grounds of Pines Manor Inn. MWWWI members had a delicious lunch and planning session for the coming year, 2014 2015. Insh'Allah there will be ten meetings, including conferences, writing workshops, book festivals and visiting authors to conduct workshops. Specific meeting details will be forthcoming the end of summer and will be sent via email. Contact Zakia at ummfaiza@yahoo.com. Habeebullah: Allah Chose Him! Was the theme of WCMAS 31st Annual Conference. MWWWI members attended and chose not to vend this year. However, the excitement, activities and energy level exhausted us as if we were vending and all the work that that entails. This year we were able to concentrate on attending the workshops and to explore the vending at our leisure which was a welcome relief. Some of the workshops were: Miracles of the Prophet, The Ultimate Diplomat, The Perfect Family Man, The Way to His Perfect Salah, The Perfect Example of a Friend, and His Character was the Qur’an, etc…There was another added benefit: because of our early bird registration, MWWWI received VIP status, black and white tote gift bags and preferred seating in the ballrooms for meals and keynote addresses. Friday night Meet and Greet: ‘An Evening of Black and White Elegance,’ was held in the Constellation Ballroom. It was memorable because of the wonderful fashion statements displayed by the sisters, wearing all white, or a combination of black and white ensembles. Special gift plaques were given to sisters who volunteered to read, short ayats, hadiths and other stories about what makes an elegant Muslim woman. Saturday night provided an additional bonus with the opportunity for three MWWWI members to participate in the Seasoned Sisters program. Jamillah Abdul Muhaymin and Zakia Iman Shahbaz recited a two voice poem written by Jamillah. Zakia recited her poem written about the conference’s theme, and Haleemah Abdul Muhaymin read her poem, from ﻿MWWWI﻿ Life is A Journey, 2010. MWWWI is looking forward to attending and vending next year, insh’Allah! April 12, 2014 - MWWWI sponsored ‘Phenomena’s Poetry Workshop,’ on Sat. April 12, 2014, at Haleemah’s house in Beltsville, MD. 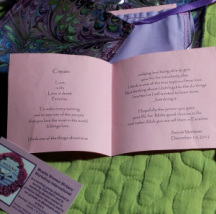 Each sister was presented with a 'poem in a pocket,' to read and share with each other. 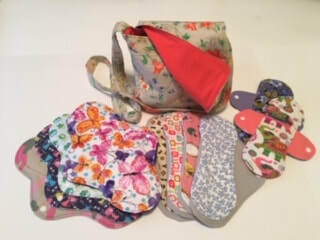 These delightful 'pockets,' were made by Haleemah Abdul Muhaymin. It was a wonderful event giving attending sisters the opportunity to not only learn the basics about writing and presenting their own poetry but also to witness the colorful, dynamic poetry recitations of Safiyyah Abdullah, herself. 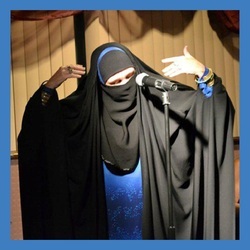 Safiyyah, also known as, ‘Phenomena,’ emotes not only with her voice and facial expressions but also with her hands which move to the sound/beat of her voice and enhance the already exciting language of her poetry. Sisters worked in two person teams and created a two voice poem that showed both sides of a conflict. We were free to select our own conflicts and afterwards recited our poems. A fun and eventful time was had by all. Afterwards, Zakia, of MWWWI, presented Safiyyah with MWWWI members’ books. Refreshments and inspiring conversation followed. September 21-22, MWWWI attended the Library of Congress (LOC) 2013, National Book Festival on the National Mall in Washington, DC. MWWWI members enjoyed the contributions of the participating authors and the ambiance of the book loving public. June 8, MWWWI had our annual luncheon at Tea on the Tiber, in Ellicott City, MD. The Amazon Rain Dragon, by Haleemah Abdul Muhaymin/ the latest addition to her Journeyers Series, #3. MWWWI also presented, Haiku, Signature Impressions, MWWWI Seventh Annual Folio, 2013. Information on how to purchase our books will be posted shortly. April 6-8, MWWWI members attended the Women’s Committee of Masjid As-Saffat 29th annual conference at Marriott Hunt Valley. Three of us presented our newly published books, Hidden Royalty (princess series) by Haleemah Abdul Muhaymin, Islam for a New Shahada, by Jamillah Abdul Muhaymin, and Ameerah and the Missing Lunchbox, second in the Ameerah series by Zakia Iman Shahbaz. April 6, MWWWI sponsors the winner of our annual writing contest to attend WCMAS annual conference. Congratulations to Crystal Walcott- MWWWI 2012 Writing Contest Winner! She turned to her family but they were khufar. She turned to her sister in Islam but they were too far. Until she heard a sister speak. A coming together without any men. Times to befriend, speak, and learn. A time to do the things that she had always yearned. She listened and spoke and learned how to feel. Then realized she had what she needed all along! And then belief would increase and bring her relief. Look to Allah, not yourself for advice. And that's why he provides us with Muslim women's conference fans! May Allah Grant me another Year at the conference!!! June 2, MWWWI annual luncheon, A Taste of Words, Readers and Eaters. Majeedah Neale, catered the meal, a delicious repast of raw specialities: pasta primavera, kale salad, citrus herb fresca, and chocolate moose strawberries. MWWWI members read from their selected works. October 13,MWWWI second Skype international meeting. (Sharjah, UAE, United Kingdom, New Jersey). November10, MWWWI third Skype international meeting. February 26, MWWWI members, Zakia Iman Shahbaz and Haleemah Abdul Muhaymin were invited to participate in a Writer’s Workshop - Tenses and Tea Organized by Girl Scout Troop 2802, at Al-Huda School College Park. MD, 10:00 am until 2:00 pm. April MWWWI published its Fifth Annual 2011 Folio, Tapestry of Dreams, A Progressive Story by Muslim Women. April 22-24, Marriot Hunt Valley, MD – MWWWI members attended the Women’s Committee of Masjid As-Saffat 28th annual conference. MWWWI members presented their new books. Zakia Iman Shahbaz- Ameerah’s First Day. Haleemah Abdul Muhaymin presented her new books, Sequoiadendron, (Journeyers series) and Shawiya, Warrior Princess (Princess series). September 24-25, MWWWI members attended the Library of Congress Tenth Annual Book Festival at the National Mall, Wash DC, 2011. October 8, Beltsville, MD, MWWWI Guest, Khadija Dawn Curryl has over 10 years’ experience with henna and natural hair care, and has been practicing body art as a professional henna artist since 2005. Jamal a lifetime Health and Fitness Enthusiast has been using henna in his hair and body since his adolescent years. They are the owners of www.hennasooq.com. Khadija presented a workshop, Internet Business Marketing Tips. May -MWWWI’s first end of year party in USA was held at Amina Thai halal restaurant in Rockville, MD. The food was good. MWWWI published its Fourth Annual 2010 Folio, Life is a Journey, Beltsville, MD . It was presented at the meal’s end. May 15, MWWWI member Zakia was invited to vend her books at the Dove Quilting Society 3rd Annual Celebration, Saturday in Philadelphia, PA.
June MWWWI members attended and vended at the Muslim Women United of Richmond, VA annual conference. May, MWWWI published its third annual folio in Sharjah, UAE, Delightful Musings by Muslim Women. 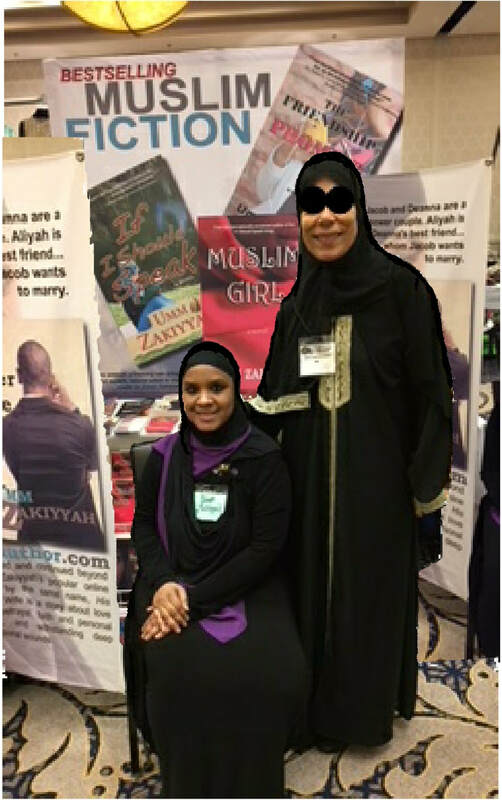 Zakia jmoves to USA and joined forces with Haleemah Abdul Muhaymin and continued MWWWI meetings in the States. June, MWWWI member, Zakia was a speaker at the ISNA Convention, at the Convention Center in Washington DC. She was a participant in the author’s workshop and presented her book, A Trophy for Bilal.